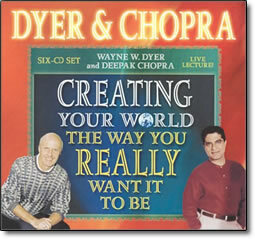 Creating Your World The Way You Really Want It To Be – by Wayne Dyer & Deepak Chopra – Discount! In this truly inspirational audio program, Dr. Wayne Dyer and Dr. Deepak Chopra, two of the most highly respected authors and teachers in the fields of success and transformation, tell you how you can create your world the way you really want it to be. Dyer and Chopra begin by telling you how to reduce the time between when you decide what you really, really, really, really want, and when it actually manifests. These two thinkers go on to contemplate the wisdom of the ages–the legacy of humanity’s great poets, philosophers, and spiritual teachers. Like them, we all search for oneness with the parts of life that are constant and unchanging. They then discuss seven steps to help you get in touch with your success consciousness. By experiencing each of these steps, you can achieve everything you’ve ever dreamed of. Packed with powerful information, this incredible audio program will enlighten, inspire, and teach you how to achieve all that your heart desires!